The research theme of our laboratory (meteorological laboratory) is atmospheric dynamics and middle atmospheric science. Atmospheric dynamics is a theoretical field of studying atmospheric phenomena using equations such as fluid mechanics and thermodynamics. The middle atmosphere refers to the atmosphere in the height region from ~10 km to ~100 km (stratosphere, mesosphere, and lower thermosphere). Here, unlike the troposphere, vigorous convection does not occur. However, the middle atmosphere is extremely dynamical region, in which various atmospheric waves originating from the troposphere interact with the mean flow and/or other waves with different scales, or generate secondary waves through instabilities. The middle atmosphere is attracting attention not only because it includes the ozone layer that protects surface life from harmful solar ultraviolet radiation, but also because it is an important area that influences tropospheric phenomena and surface climate downward through its general circulation. We conduct high-resolution observations with a high-power atmosphere radar installed in the Antarctic (the PANSY radar), perform high-resolution model simulations using super computers, and theoretically interpret the atmospheric phenomena that are included with a hierarchical structure in the big data produced by the observations and simulations. While placing the middle atmosphere as our axis, we are conducting advanced research on dynamics of the whole "neutral" atmosphere from the troposphere up to the lower thermosphere that is the target of meteorology. 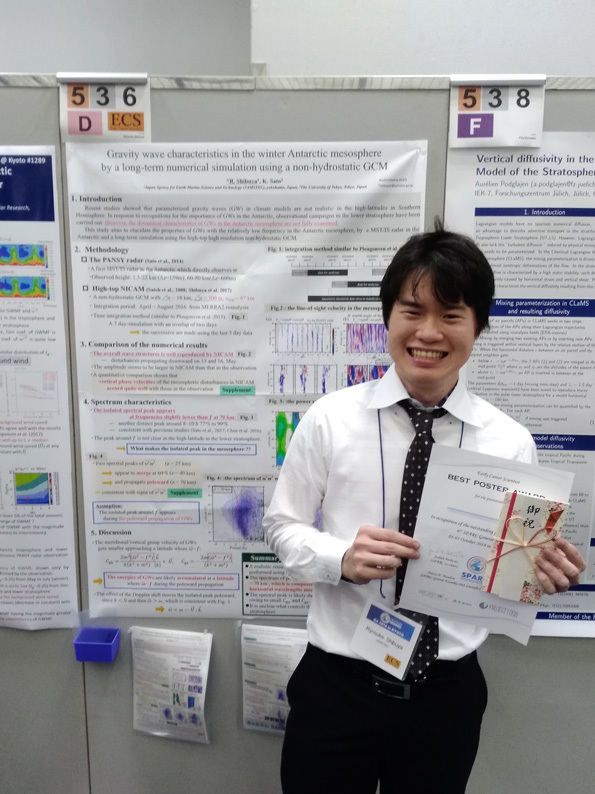 A paper by Sato, K. and S. Hirano, entitled "The climatology of the Brewer–Dobson circulation and the contribution of gravity waves" was published in Atmos. Chem. Phys. (https://doi.org/10.5194/acp-19-4517-2019). A paper by Kohma M. et al., entitled "Estimate of turbulent energy dissipation rate from the VHF radar and radiosonde observations in the Antarctic" was published in J. Geophys. Res.-Atmos. (https://doi.org/10.1029/2018JD029521). Mr. Arata Amemiya obtained his PhD from The University of Tokyo. A paper by Minamihara, Y. et al., entitled "Statistical characteristics of gravity waves with near-inertial frequencies in the Antarctic troposphere and lower stratosphere observed by the PANSY radar" was accepted in J. Geophys. Res.-Atmos. (https://doi.org/10.1029/2017JD028128). Two papers by Sato, K., R. Yasui, and Y. Miyoshi entitled "The momentum budget in the stratosphere, mesosphere, and lower thermosphere Part 1: Contribution of different wave types and in situ generation of Rossby waves" and by Yasui, R., K. Sato and Y. Miyoshi entitled "The momentum budget in the stratosphere, mesosphere, and lower thermosphere Part 2: The in situ generation of gravity waves" were accepted in J. Atmos. Sci. (https://doi.org/10.1175/JAS-D-17-0336.1, https://doi.org/10.1175/JAS-D-17-0337.1). A paper by Amemiya, A., and K. Sato, entitled "A two-dimensional dynamical model for the subseasonal variability of the Asian monsoon anticyclone" was accepted in J. Atmos. Sci. (https://doi.org/10.1175/JAS-D-17-0208.1). Prof. Kaoru Sato delivered Atmospheric Sciences Section Distinguished Lecture at the 15th Annual Meeting of Asia Oceania Geoscience Society (AOGS). Prof. Kaoru Sato received Fujiwhara Award of the Meteorological Society of Japan for planning and promotion of the Program of the Antarctic Syowa MST/IS radar and for development of the middle atmospheric dynamics. A paper by Nishiyama, T., et al. entitled "Simultaneous observations of polar mesosphere winter echoes and cosmic noise absorptions in a common volume by the PANSY radar (69.0S, 39.6E)" was published in J. Geophys. Res. Space Physics (https://doi.org/10.1029/2017JA024717). Dr. Ryosuke Shibuya received the research encouragement award of Graduate School of Science, The University of Tokyo. Mr. Ryosuke Shibuya obtained his PhD from The University of Tokyo. A paper by Thurairajah, B. et al., entitled "Simultaneous observation of gravity waves at PMC altitude from AIM/CIPS experiment and PANSY radar over Syowa (69°S, 39°E)" was published in J. Atmos. Sol.-Terr. Phys. (10.1016/j.jastp.2017.10.006). A paper by Hayashi, Y. and K. Sato, entitled "Formation of two-dimensional circulation in response to unsteady wave forcing in the middle atmosphere" was accepted in J. Atmos. Sci. (10.1175/JAS-D-16-0374.1). A paper by Tsutsumi, M. et al. entitled "Characteristics of mesosphere echoes over Antarctica obtained using PANSY and MF radars" was published in SOLA (10.2151/sola.13A-004). Dr. Yukari Sumi joined our laboratory as a Project Researcher. A paper by Shibuya, R. et al. entitled "Quasi 12 h inertia-gravity waves in the lower mesosphere observed by the PANSY radar at Syowa Station (39.6°E, 69.0°S)" was published in Atmos. Chem. Phys. (doi:10.5194/acp-17-6455-2017). Congratulations, Shibuya-kun! A paper by Sato, K. et al. entitled "Frequency spectra and vertical profiles of wind fluctuations in the summer Antarctic mesosphere revealed by MST radar observations" was published in J. Geophys. Res. Atmos. (doi:10.1002/2016JD025834). Dr. Masashi Kohma received the "Yamamoto Award" by the Meteorological Society of Japan on "A study on the dynamics of polar tropopausal cloud appearance"
A paper by Hirano, S., et al. entitled "A three-dimensional analysis on the role of atmospheric waves in the climatology and interannual variability of stratospheric final warming in the Southern Hemisphere" was published in J. Geophys. Res. Atmos. (doi:10.1002/2015JD024481). A paper by Tsuchiya, C., et al. entitled "MJO-related intraseasonal variation of gravity waves in the Southern Hemisphere tropical stratosphere revealed by high-resolution AIRS observations" was published in J. Geophys. Res. Atmos. (doi:10.1002/2015JD024463). A paper by Shibuya, R., et al. entitled "A Grid Transformation Method for a Quasi-Uniform, Circular Fine Region Using the Spring Dynamics" was published in J. Met. Soc. Japan (10.2151/jmsj.2016-022). A paper by Sato, K., et al. entitled "Climatology and ENSO-related interannual variability of gravity waves in the Southern Hemisphere subtropical stratosphere revealed by high-resolution AIRS observations" was published in J. Geophys. Res. Atmos. (doi:10.1002/2015JD024462). A paper by Minamihara, Y., et al. entitled "Characteristics of Vertical Wind Fluctuations in the Lower Troposphere at Syowa Station in the Antarctic Revealed by the PANSY Radar" was published in SOLA (10.2151/sola.2016-026). A paper by Amemiya, A., and K. Sato et al. entitled "A New Gravity Wave Parameterization Including Three-Dimensional Propagation" was published in J. Met. Soc. Japan (10.2151/jmsj.2016-013). A paper by Yasui, R., et al. entitled "Seasonal and Interannual Variation of Mesospheric Gravity Waves Based on MF Radar Observations over 15 Years at Syowa Station in the Antarctic" was published in SOLA (10.2151/sola.2016-010).